Teletext was developed in the 1970s in Britain as a way of sending information (text and basic colour graphics) in a PAL television signal. The BBC implemented it as Ceefax (1974 to 2012), and numerous other broadcasters in PAL countries also used it. In Australia it was called Austext (1982 to 2009) and broadcast on Channel 7. Apart from screens of information, the technology was also used to provide captions for TV programs (in Australia on page 801 on all networks). In Australia, it ended in part because the original equipment was at end-of-life, no doubt combined with the rise of the Internet for getting that sort of information. THE AUSTEXT SERVICE WILL CLOSE ON 30 SEPTEMBER 2009. The Seven Network started providing test Teletext services in 1977, with live services commencing in 1982 in Brisbane and Sydney. The Austext service today is still provided using the original 1970’s technology. This equipment has now reached the end of its lifespan. Unfortunately,it is not possible to replace the existing Austext system with new equipment except at significant cost. When the BBC Micro was introduced in 1981, this included a graphics mode (Mode 7) that natively supported teletext graphics. Given the computer only originally had 16-32 Kb of RAM, this mode using only 1 Kb was handy to have. It was mostly used by text-based programs, though there was the odd action game implemented in it — I remember a rendition of Space Invaders that used Mode 7. In schools, BBC Micros could be networked together using the Econet system. A Teletext-like system was available that I think was called Eco-fax — we had that at my high school. Less common, and only used in Britain, was a special Teletext adaptor, this could be used to download computer programs. Teletext on broadcast television might be long gone, but there’s one place the technology is still used: in Australian racing. 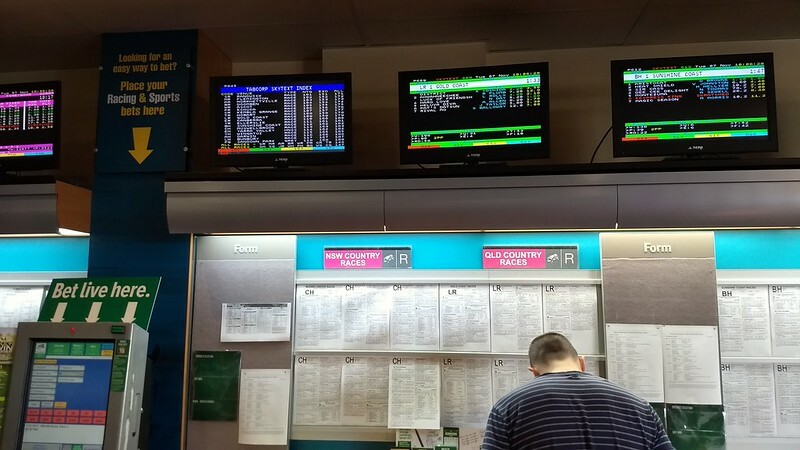 Walk into any betting shop (this photo is from a TAB in Melbourne) and you’ll find these familiar text displays, with 8 colours, the capability of flashing and double-height text, and simple graphics, under the brand name “TabCorp Skytext”. I have no idea how the signal is broadcast, but it’s definitely the same display technology. Nice to know it lives on, over 45 years since it was devised. This entry was posted in AU, Europe, Nostalgia on Tue 2017-11-07 by daniel. The following rant comes courtesy of a speaker to a group of volunteer developers working on OpenMRS, who recounted her experiences of volunteering as a doctor in India. Naturally, when you go under the knife for a surgical procedure, you’d want the surgeon using the latest, most advanced techniques, as demonstrated by empirical evidence. Health systems want the surgeons to use the most efficient technique, expressed in positive outcomes per money spent. You’d expect that in today’s world, you’d get one of the two, or perhaps somewhere in between. Say that the latest technique uses robo-surgeons. Let’s call that technique Z. It was pioneered in a university teaching hospital at enormous cost, because they’d never built one before; there’s no commercial provider of the equipment yet, so technique Z hasn’t percolated to wider practice. Most other hospitals use techniques X or Y, one requiring more, highly trained staff, and the other requiring fewer staff but a couple of expensive pieces of equipment. Techniques X and Y are variations on T, U, V and W, some of which date back to the early sixties, and stem off from technique S. If you look at textbooks, S is mentioned by name, and T, U, V and W have one- or two-sentence descriptions because while major leaps forward at the time, they’re now obsolete in the era of X and Y. The medical textbooks describe how to do X and Y in detail. In developing countries, you don’t have either the many staff, the highly trained staff or the expensive pieces of equipment. U, V and W are all unavailable because of this. T uses equipment that can’t even be procured any more and certainly isn’t lying around waiting to assist with surgery now. The developing world needs medical and surgical texts that don’t demand powerful diagnostic tools, expensive equipment or highly specialized staff. A competent surgeon can do their work without any of these; they’ll get worse expected outcomes, but those outcomes will be better than inaction. There are no textbooks currently available to instruct a surgeon with limited resources. Even battlefield surgeons expect to stabilize their patient and ship them off to much better hospitals. The ongoing progress in medicine is leaving behind the poorest and most vulnerable on our planet; our indifference to the preservation of these old methods are affecting us now, in ways I would never have guessed at. This entry was posted in Books, Data loss, Nostalgia on Thu 2014-05-01 by josh. There’s various convoluted steps to get LAN play working on more recent versions of Windows. Mount the ISO on your hard drive, and use the somewhat unstable Microsoft supplied ISO mounting program to fool the program into thinking you CD is in a CD drive. Install Diablo from here. This step is not strictly necessary, but it’s so much quicker and cleaner than the alternatives. Fetch and apply the patch to bring Diablo 1.00 up to version 1.09. It may also be helpful to pull up the properties of the .exe and enable compatibility mode with WinXP Service Pack x. When fetching patch, get it for the version you’re installing – much confusion is caused if you get the spawned Diablo patch and apply it to the full version. Go and get IPXWrapper, and per the instructions drop the DLL files into your Diablo directory. If you have a heterogeneous environment, all machines need to use this wrapper – IPXWrapper is a translation layer than transforms IPX into UDP, and without it IPX aware OSes like WinXP won’t see the network traffic of the IPX unaware OSes like Vista. Punch a hole in your Windows Firewall to allow UDP port 54792. See? Easy. Doesn’t take more than a few hours if you don’t know what you’re doing. This entry was posted in Games, Nostalgia, Windows on Tue 2014-03-04 by josh. In Coles on the weekend, I bought (from an enormous stack) this season’s Fruit Mince Pies. Only five months to go before this particular seasonal treat is only on the shelves for a couple of post-Christmas months as stocks are wound down. Yesterday marked 30 years of the Commodore 64. Meanwhile, a documentary about the origins of the UK games industry in the 70s and 80s, From Bedrooms To Billions is in the works, but needs pledges of support to be made. If you donate, depending on the amount, you get some pretty cool gear including a digital or DVD copy, posters, your name in the credits, a T-shirt, and even a personalised portrait of yourself from ZZap64 illustrator Oliver Frey. Some of the higher donation amounts actually include vintage computers/consoles and signed (by the authors) copies of classic games for them. Zowee. They’re aiming to raise the money by 17th of August. This entry was posted in Nostalgia on Wed 2012-08-01 by daniel. This is pretty cool: the 6502 source code to the original Apple II version of Prince Of Persia has been released. The article also includes the story of how it was lost, found and recovered. This entry was posted in Nostalgia on Thu 2012-04-19 by daniel. This entry was posted in Nostalgia on Tue 2012-04-10 by daniel. I rise to speak on the Classification (Publications, Films and Computer Games) Amendment (R 18+ Computer Games) Bill 2012. I am sorry that I cannot join in the debate about slide rules and slates, but, like the member for Solomon, I do remember having the Commodore 64. I do remember that, to play a computer game, you had to sit and wait for a tape player to load a game for about half an hour, and hope that it did not get caught some way through it, so that you could play a game of Aztec Challenge or Soccer. The most violent it got then was that a gorilla might throw a barrel at your head while your character was playing, but that was about it. But things have moved on enormously since then. There have been advancements in technology, advancements in innovation and advancements in people’s creativity, and that is a good thing. It is extraordinarily to be welcomed. But it is time for the law to catch up. This entry was posted in Nostalgia on Fri 2012-03-16 by daniel. Amazing the things you find during a clear out. 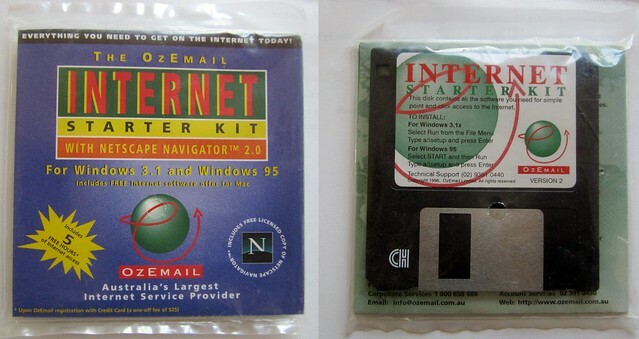 Here, from 1996, is an Ozemail disk. Australians would remember they used to turn up in magazines and so on, though they were never quite as ubiquitous as the America Online disks that seemed to show up everywhere in the North American magazines. I haven’t tried to see if this one will still install on Windows 7… in fact for now it’s still sealed in its plastic. The Ozemail web site www.ozemail.com.au forwards to iiNet, so I guess they got bought out by them somewhere along the line — in 2005 according to Wikipedia. This entry was posted in Nostalgia and tagged Ozemail on Mon 2011-11-14 by daniel. Another one for the nostalgia buffs: a great article comparing 8-bit fonts. This entry was posted in Nostalgia on Sun 2011-04-17 by daniel. From BBC’s “The Computer Programme”. The sound is loud and distorted, so turn your volume down before you click play. I didn’t think the LEN function would work without parenthesis around the variable, but there you go. This entry was posted in Nostalgia on Thu 2011-04-14 by daniel.